Happy Quilting: Summer Solstice Quilt-A-Long!!! Just like in previous quilt-a-long's, there will be easy step-by-step bi-weekly directions, stunning Quilt-A-Long kits in a range of colors palates that will be revealed next week, fabulous fabric prizes that include bi-weekly progress prizes and Grand Prizes at the end, and most importantly lots of fabric fun with friends!!! It will run all summer and is going to be a blast!!! Here is the schedule . . . It all starts next Thursday!!! So what do you say?? Do you want to Quilt-A-Long with me??? 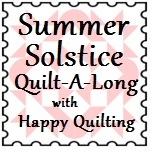 Grab a button and and get ready for some Summer Solstice Quilting Fun!!! I really like the curves and the hot fiery palette makes this look really summery already. Thanks a million for sharing this with us! Yay! I can't wait! And I just love the pattern. I'm super excited for this quilt along. I love your pattern - and I think I have some fabrics stashed in those lovely oranges, reds and yellows that will be perfect. Thank you for sharing!!! I really like the design, but LOVE the colors you choose to introduce it in. I'm excited to try to keep up with one! This will be such a pretty quilt! I like the design very much. I have a FQ stack of blues, greens, aquas that I think will work perfectly. Thanks so much. I love the design and I also like the colour palette of you picture. I'll do my best to keep. I haven't done a quilt along with you since the tetris quilt so I'm really looking forward to this one. Yay!! I love your qal's!!! This will be my 3rd!! I'll admit it, I was one of the medallion people. However, I'm really excited to give this pattern a go! I have yet to attempt curves so it will be great to do this along with you and learn. Love the pattern and the fiery colors that you are showing. Can't wait to see the fabric requirements so that I can start digging in my stash - or have and excuse to shop. I so can't wait! This is going to be awesome. The pattern is gorgeous. I will admit I am a little bit nervous about the curves but I am willing to give it a try! I was one of the medallion people! But I really like this too! I can't wait to start! I absolutely love it!!! (And I was on the medallion band wagon-but this is so awesome I don't care that it isn't medallion!!) Thanks so much for all the work you do to organize and run these-so excited!!! I'm excited! The medallion requests were scaring me because i'm such a new quilter. As it is, this pattern will have me tackling lots of new things (flying geese, drunken path), so it's perfect for me. Can't wait! You always get me with your quilt-alongs! I like the bit of curved piecing you chose for this block. this quilt is wonderful.I love the colors you used. Love this quilt, pattern and colors - will take part!! This design is inspiring as well as the color choices. I'd love to sponsor the quilt along with PDF patterns! I look forward to seeing all the quilts. Love the quiltpattern you chose for the sew along! Beautiful! Thinking this just might be the perfect QAL for my precious Liberty of London. That is my forum I use, do you have a hashtag? Such a lovely quilt for summer. I like the sunny colors and that little bit of curve in the design. I would love to join in for the QAL, but I have a quilt with a timeline that I'm just starting. Sigh. I'm eager to see how everyone else's turns out, though. Wow!!! love this Pattern! Beautiful quilt!! What a stunning quilt! Wish I had time for a quilt along. It sounds like so much fun. Oh I SO want to join in on this QAL - can I manage to carve out some time for it? Um, why yes, I think I can! Thanks for sharing another beautiful quilt along. I like the curves that make it a little different and I want to do one in shades of aqua. Also, thanks for sharing your review of Lara's new applique book. Beautiful quilt for a fun QAL! Melissa, I'm also visiting from BuzzinBumble and so glad I dropped by! This is so pretty and looks like a fun QAL. I'm not very good with keeping up with QALs and BOMs, but I'm going to give this one the old college try. Thank you for taking the time to put it together. I missed this post at first! It looks lovely, and though I have a weak spot for medallions, you have to go for a setting that you like. I also love the colours you show this in, so summery! Wonderful QAL-love the summery colors.